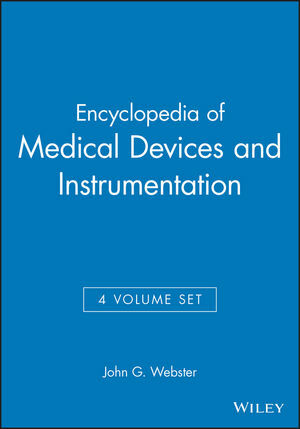 This objective, referenced collection of over 300 articles will cover every aspect of medical devices and instrumentation in four volumes, totalling about 3,000 pages. The Encyclopedia will define the discipline by bringing together the core of knowledge from all the fields encompassed by the application of engineering, physics, and computers to problems in medicine. Some of the many areas covered will include: anaesthesiology; burns; cardiology; clinical chemistry and engineering; critical care medicine; dermatology; dentistry; endocrinology; genetics; gynecology; microbiology; oncology; pharmacology; psychiatry; radiology; surgery; and urology. Cross-references and index included.